Med Associates, Inc. Technology: Some services included for an additional fee include: electronic medical records, meaningful use implementation, appointment scheduling and more. Med Associates is committed to offering our clients flexible, state of the art technology which allows you to take advantage of the latest advances and facilitate the integration of the entire patient management system. Med Associates offers a secure, certified EMR application for clinicians providing efficient and comprehensive access to patient records. Customizable templates and flow sheets enhance automated and streamlined workflow. Our experienced staff will come onsite to supplement the vendors training, giving you the extra resources needed for a smooth implementation. 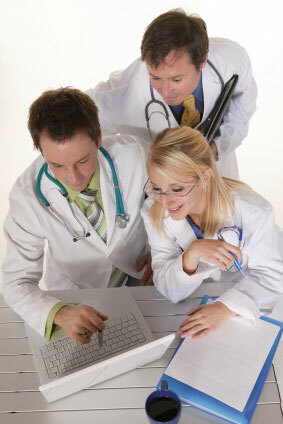 Achieving Meaningful Use is more than just purchasing a certified EMR. Our knowledgeable staff will help with the implementation process. We understand guidelines and attestation requirements. A user friendly appointment scheduling feature is designed to be an entity wide scheduling solution, meeting the needs of a single provider or complex organization of multiple providers and resources. Ability to call, text, or email patients to remind them of their appointment. This feature is available as an add-on to our scheduling module. Increase collections, reduce bad debt and accelerate payments. Utilize a real-time payment processor to accept front end office payments, handle remote deposit functions and offer your patients a simple, convenient and secure option to pay online with credit and debit cards including varieties of healthcare accounts such as health savings accounts, flexible spending accounts and health reimbursement accounts. Billing documents are converted to secure electronic images, accessible to our clients anytime, anywhere. Med Associates’ HL7 interface engine enables healthcare applications and organizations to easily exchange electronic information with our practice management software. This feature provides our clients with considerable flexibility when choosing an EHR and selecting strategic partners.